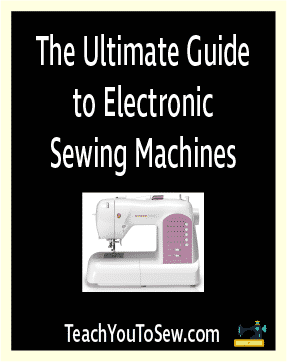 An electronic sewing machine makes all kinds of DIY, home improvement, textiles and hobby projects possible and easy that would otherwise take a large amount of work and skill. Whether you just want to be able to fix your own clothes when they tear, you want to create your own new clothes from scratch, or you like the idea of monogramming things to personalize them – an electronic sewing machine will make your life easier and make the process a lot more fun. But how do you go about buying an electronic sewing machine? What features should you be looking for? 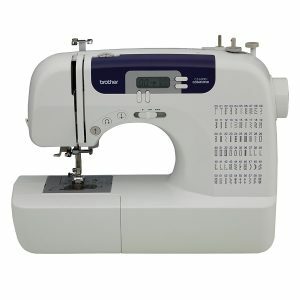 To answer these kinds of questions, you first need to think about how you intend to use the electronic sewing machine. How often will you be using it? What jobs is it likely to be doing on the most regular basis? What is your budget? You also need to consider the type of needle you buy to go with the machine, whether this is a universal needle, a ball point needle or an embroidery needle. Consider how large the bed is (the flat surface that you will lean on), is it big enough to fit the fabric you want to work with? And look for the power of the motor if you are going electric which will tell you how easily it will be able to sew through thicker materials. Finally, look for added features like laser sights, foot pedals, LED displays for easier interfacing and safety features like jam-prevention. The number of different stitches is also important and you want to make sure that the device comes with the stitches you need. Some machines will also come with sewing patterns pre-loaded! With that in mind, here are the 7 best electronic sewing machines for your consideration. If you have a lower budget and you’re looking for something a little simpler, here are some good choices to get you started. It is a good pick for beginners, not only because of the relatively low price but also because of the easy-to-load drop-in Bobbin system. 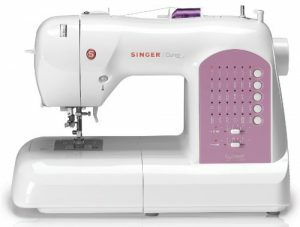 It has an LED readout for selecting the features and settings you want to use and it has an electronic auto-pilot mode which allows you to sew without using the foot pedal. Adjustable speed adds to versatility and a ‘staybright’ LED illuminates the bed so that you can see what you’re doing. 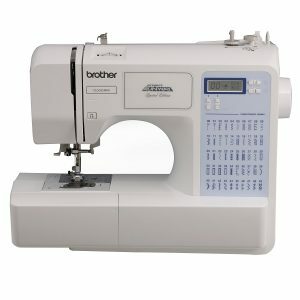 This is our top choice for best sewing machine under $200 as the build quality is really better than what you would expect for the price. Reviewers praise the quality of the machine, its many features and its ease of use and scores compare very favourably with similarly-priced competition. It doesn’t look like anything much of course: the design is fairly basic. And at 110 volt, it’s not the most powerful machine in the world, nor does it have the biggest bed. But this is an excellent choice for beginners that is easy to use and very reliable. With a larger bed than the Singer, this is a sewing machine that would be well suited to sewing onto larger fabrics. This large bed is made possible thanks to an extending table with supportive feet and it’s a little more powerful as well. Once more, you get 100 different stitches and these include decorative and heirloom stitches. The manufacturer’s description states that it is suitable for monogramming too, which opens up some additional possibilities for this machine. Again, there is an LED as well and easy bobbin winding. An LED makes interaction simple. 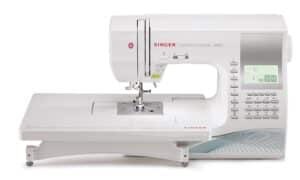 Another well-priced sewing machine that comes with a wide table for larger projects. Surprisingly powerful for the price and size with jam resistant features and the ability to view and alter the 60 built-in stitches via an LCD display..
although it is rather small and doesn’t provide a huge amount of information it is still a great option at this price. An LED light helps you see what you’re doing and easy threading and easy bobbin winding makes this suitable for beginners. It’s not the best selection of features for the money but it’s another reliable and well-made machine nonetheless. There are a ton of extras here too, including a monogramming foot, zipper foot, an accessories pouch, needle set and more! This model has fewer built-in stitches with only 30 included and is not the most affordable on the list either. It’s not the best value for money overall then, though it does have one of the nicest designs in pink and white. That and it also offers an exclusive ‘SwiftSmart’ threading system which claims to make your work quicker and easier! 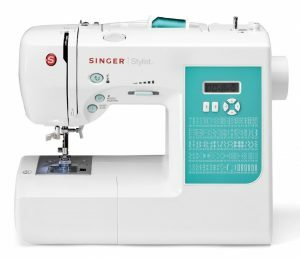 And while there aren’t quite so many different stitches here, you do get many of the other features we’ve seen so far on this list, including LED for sewing when it’s hard to see, drop-in bobbin system and automatic needle threader. If you’re looking for something a bit more capable, then the Singer 9960 is a good place to start. Right away, you’ll get a whopping 600 different built-in-stitches, with 13 full-automatic 1-step button holes. The digital information advisor is a little daunting at first but offers lots of guidance and help for those just getting started. There’s tons of manual control and a large work surface that is extendable for when you need to get more work done. 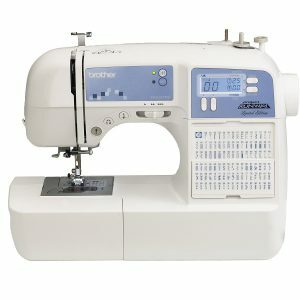 This is an advantage it actually has over our top pick for ‘full featured’ sewing machine. Electronic autopilot makes life easier for you, while stitch editing takes the huge range of stitch choices even further by letting you alter and edit your own precisely as you want them. Everything else is here as you’d expect including an LED display, easy Bobbin drop-in and safety features. Another lower-priced machine that is actually the cheapest of the bunch at the time of writing. Of course you will experience some trade-offs here as a result however. You only get 50 stitches here, as opposed to the 50 found in the previous two machines. Likewise, the work bed is really quite small, making it best suited to smaller fabrics. Part of the reason for that small bed though is that there is an emphasis here on portability. The Brother Project Runway comes with a carry handle and is ideal for moving from room to room and even taking to classes. So it’s not the best value for money necessarily but if you have meagre needs and primarily want something affordable, the Brother Project Runway is a good choice. And it’s ideal for those that want something they can bring to class! For those that want the very best available, this computerized sewing machine model doesn’t disappoint. 960 stitches build in, 13 button hole styles, various fonts and lots of auto stitch settings. The interface is handled by a full-color touchscreen which makes it incredibly simple and easy to choose the various different fonts and patterns you want and to change settings and generally navigate your way around the options and UI. Meanwhile, the power is easily enough to make short work of anything you throw at it while speed control allows for plenty of precision and lots of versatility. Sewing assistance guides ensures everyone can feel like a pro – this includes audio instructions to help you know precisely what you need to be doing at any time. There are simply more extra features and settings than many people will ever likely need! It also comes with a needle pack. The device is generally very nicely made. 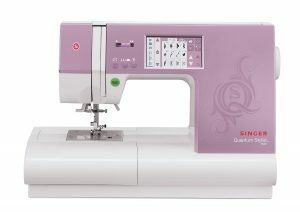 Unlike some of the other more pro-level sewing machines, this one features a rounded aesthetic in pink and white. It is well made and feels as premium as it looks. The only potential drawback compared to some other items on this list (other than the price) is the smaller work area. Though for many people, this won’t be an option. If you want something that has a bit more power, tons of customization and options but still looks and feels accessible and pleasant to use, you can’t go far wrong.